Download now the new iPhone/iPad app of NRC! 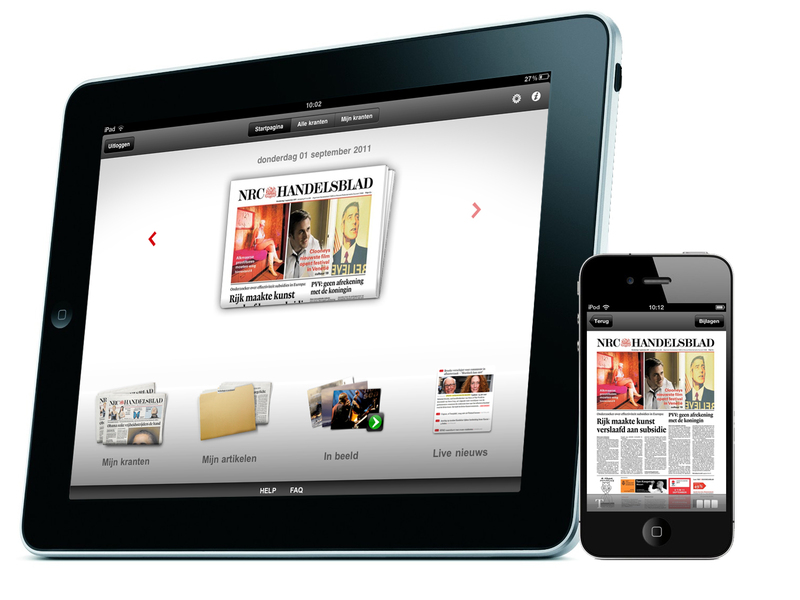 Today, an update of the dutch newspaper NRC Handelsblad has been launched on iPad and iPhone. The app is built on the MobileWeb’s publishing platform and offers readers of NRC a new interface of the newspaper. What strikes the most when downloading the app is the downloadspeed. When tapping the newspaper to start to download, the app will already open after having downloaded the first pages. This way you only need to wait for about 30 seconds. Just as the previous app, readers can easily browse the newspaper in its original way by zooming in and out and in a ‘more digital’ way. The latter way provides the full newspaper nicely converted towards a more iPad look and feel. A contents column at the left shows all articles, which are displayed fully at the right side of the screen. Another nice feature is that you can easily adapt the size of the text. In case you want to read the live headlines, this is made possible via the ‘Live Nieuws’ feed. You can find all the news articles in an easy readable format. When you find an article you like you can share it via Facebook, Twitter and Email. The new app of NRC is now available in the iTunes AppStore. With this new version NRC has taken an important next step into the e-reader and digital newspaper market, by combining its attractive content with its digital subscription system. This innovative application has been developed in just a couple of weeks time. The development cycle has been short as the application was developed on the MobileWeb Mobile Publishing platform. This platform offers media companies and publishers a fast track to get their content on a variety of mobile devices (smartphones and tablets). If you wish to receive more information about our Mobile Publishing Platform and services, please send a mail to contact@mobileweb.be. Comments Off on Download now the new iPhone/iPad app of NRC! Today, SBSBelgium released an important update of its 2deScherm application on iPad, iPhone, iPod & Android. The app goes beyond its initial target group of ‘Komen Eten’ or ‘Huizenjacht’ and integrates now an interactive electronic program guide (EPG). With the start of the new TV season, 2deScherm expands its functionalities towards the whole Flemish TV audience. 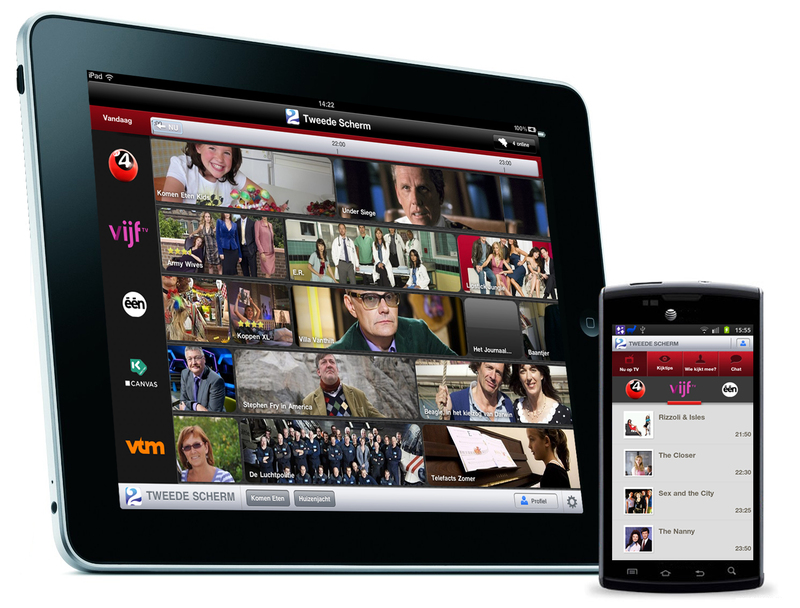 The app does not only give an overview of the programs of VT4 and VijfTV, but also integrates other dutch speaking channels (één, canvas, VTM, NED1, …). When opening the iPad app, the user will see a clever designed TV grid. Other than similar EPG apps, 2deScherm uses appealing pictures to visualize the individual formats. This results in a beautiful mosaic effect. In addition, behind every picture (or program) there is a specific page related to the TV show including: pictures, videos, content description, a chat and Twitter wall. The 2deScherm user can also give ratings on TV shows. The overall ratings are visible on the TV grid. This will motivate people to select TV programs not only on content or popularity, but also following the ratings of other 2deScherm users. A new way of watching TV ! Next to the new EPG module, the existing formats of ‘Komen Eten’ and ‘Huizenjacht’ continue with new episodes starting today. MobileWeb was in charge for the development of the application and broadens with it, its portfolio in Social TV mobile applications. The 2deScherm app is available on iPad and iPhone, the Android app will be updated later this week. Devices running Google’s Android mobile operating system encompassed more than half of all U.S. smartphone sales in the fourth quarter of 2010 according to market research firm NPD Group. Android increased its U.S. market share lead to 53 percent as 2010 closed, up 9 percentage points over Q3–Apple’s iOS slipped 4 percentage points to account for 19 percent of sales, tied with Research In Motion’s BlackBerry (down 2 percentage points). NPD notes that Microsoft’s legacy Windows Mobile OS dropped 3 points to 4 percent of the U.S. market, while its new Windows Phone 7 debuted at 2 percent, deadlocked with Palm’s webOS. The firm adds that Windows Phone 7 claimed a smaller market share at launch than either Android or webOS during their respective debuts. Apple’s iPhone 4 was the best-selling mobile phone in the U.S. during the fourth quarter, followed in descending order by Motorola’s Droid X, HTC’s Evo 4G, the iPhone 3GS and Motorola’s Droid 2. For the first time ever, NPD’s quarterly Top Five sales chart did not include a feature phone device. Android is now the top-selling smartphone OS worldwide as well–Android unit shipments surpassed Symbian device shipments for the first time in the fourth quarter according to data issued technology analysis firm Canalys. Android shipments topped 33.3 million in Q4, translating to a 32.9 percent share of the global smartphone market, Canalys reports; a year earlier, Android shipments represented just 8.7 percent of the worldwide market, a 615.1 percent leap. Symbian shipments grew from 23.9 million in Q4 2009 to 31.0 million in the most recent quarter–however, its worldwide market share plummeted from 44.4 percent to 30.6 percent during that time. iPhone shipments increased from 8.7 million in Q4 2009 to 16.2 million a year later–its smartphone market share slipped from 16.3 percent to 16.0 percent. BlackBerry fell from 20.0 percent market share to 14.4 percent as device shipments increased from 10.7 million to 14.6 million–Windows Phone also stumbled, w market share falling from 7.2 percent to 3.1 percent as smartphone shipments decreased from 3.9 million in Q4 2009 to 3.1 million a year later. Total worldwide smartphone shipments surpassed 101.2 million in the fourth quarter, up 89 percent year-over-year. StuBru app reached N° 1 free app in the Belgian iTunes Store after just 1 day! Nieuw: Studio Brussel heeft een IPhone app. Nu nog een goeie roadtest bij een treinreis of zo… #StuBru. Zeer mooie applicatie, letterlijk dan. Volledig geoptimaliseerd voor het nieuwe Retina display. Makkelijk te navigeren en zeker voldoende lees- en kijkmateriaal. Studio Brussel (StuBru) launches today his new mobile application developed by MobileWeb. The iPhone application is already in the App Store. You can find the Android application later today in the Android Market.